This recipe was developed in partnership with Produce for Kids. 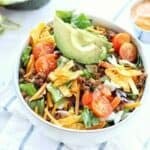 A healthy taco salad made with less than 10 ingredients in under 10 minutes! My family LOVES Mexican…the delicious flavors combined with the fresh ingredients make Mexican dishes a stable in my home. 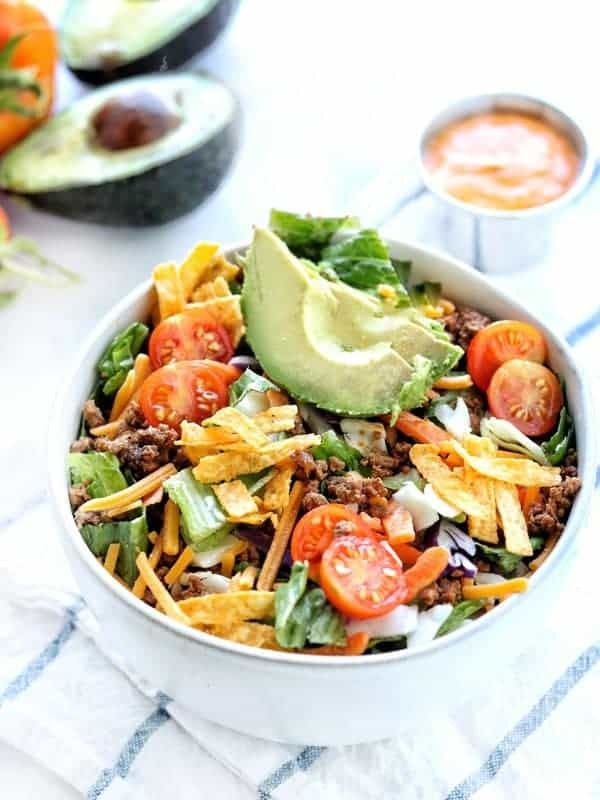 While traditional tacos will always be a top favorite, this healthy taco salad recipe is definitely a new go-to. Using the Dole Chopped Chipotle & Cheddar Salad Kit is a time saver and is an easy way to encourage my kids to eat more veggies. 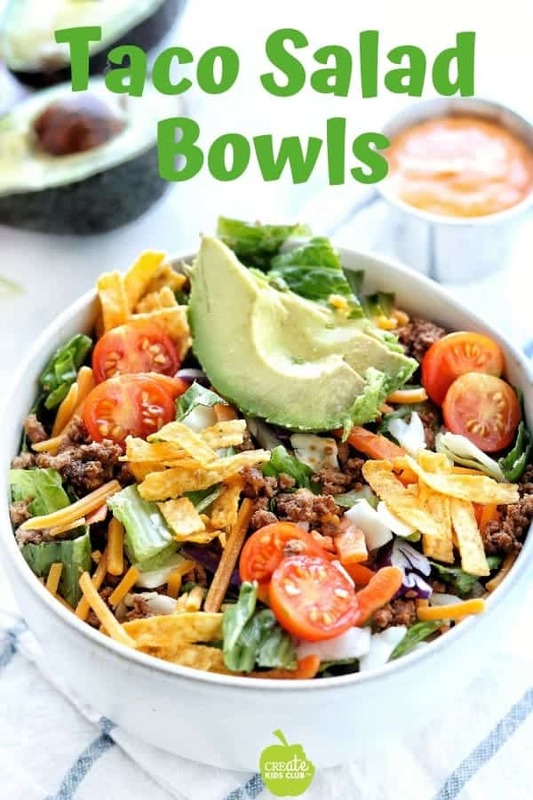 Use this as meal prep lunches for the week by dividing the taco salad bowls out into individual containers – leaving the dressing and tortillas off until serving. If you’re going with avocados, wait until right before eating to cut those up or they will turn brown. Simple, healthy, and super tasty! Making a healthy taco salad is simple. 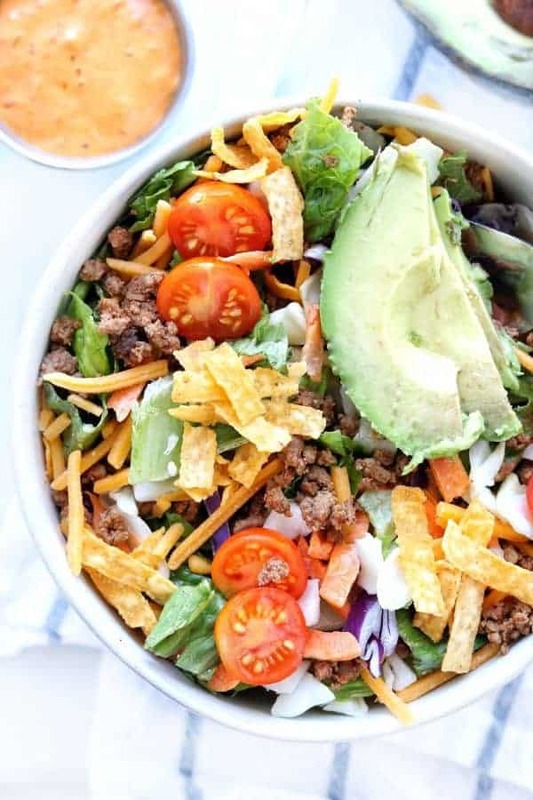 Follow this step-by-step guide on how to make a taco salad. 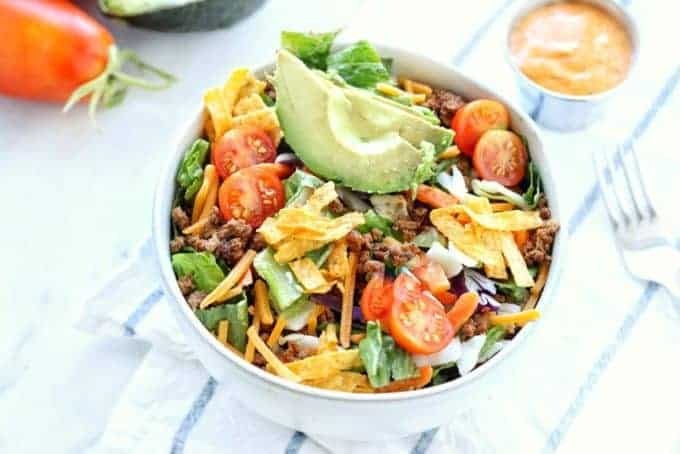 Drizzle taco salad with dressing. TIME SAVER: Use a taco packet instead of adding the seasonings to the ground beef. WHAT OTHER VEGGIES DO YOU ADD? DIETITIAN TIP: Add a can of rinsed black beans to the table as a taco salad topping to increase your family’s intake of fiber. 1 cup of beans provides 12g of fiber, which is almost half of the daily requirement! MEAL PLANNING TIP: Cook a large batch of ground beef when making this recipe. Add to other lunch or dinner dishes throughout the week or freeze for later meals. Looking for other delicious & nutritious Mexican dishes? Check out my Crunch Wrap Supreme, Mexican Street Corn Salad and Mexican Quinoa Chicken Casserole!